and the first 3 books of Xenophon’s Anabasis. I’ll confess that Sir Roger and Sir Launfal were unknown to me. Happily the Davidson library has both in its collections and I have learned a little about Sir Roger and that Lowell’s poem is a favorite of Maxine Kumin, who was a McGee Professor Writing at Davidson in 1997. The required reading list lasted until 1928. 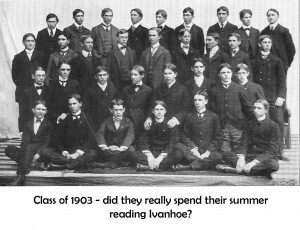 Students were given 2 lists: one for reading “with a measure of thoroughness appropriate for immature minds” and one for more detailed study. Students could pick ten books from the reading list and four from the study section. 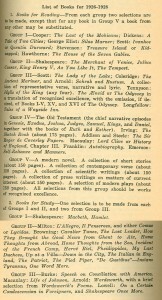 Five works remained from the 1902 list: Merchant of Venice, Julius Caesar, Silas Marner, Sir Roger, and the Ancient Mariner. New to the list were American authors Cooper (Last of the Mohicans), Hawthorne (House of the Seven Gables), Irving (The Sketchbook) Ben Franklin (Autobiography) and Emerson (Self Reliance and Manners). Also new was an option for a modern novel, contemporary verse, 150 pages of prose writings on matters of current interest or a selection of modern plays. 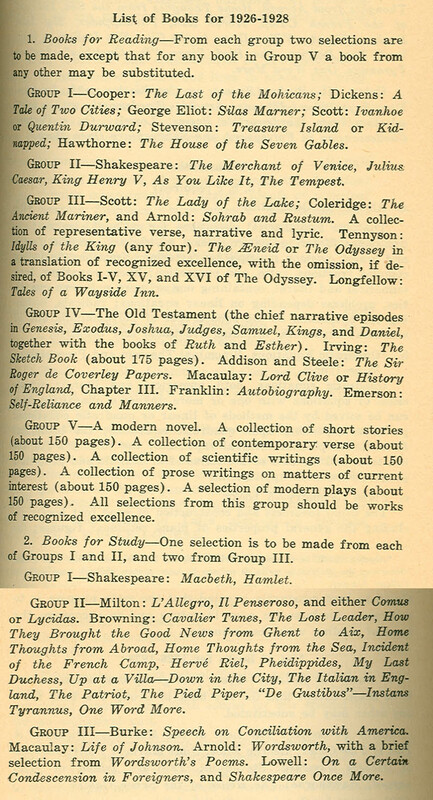 In 1948, the Alumni Journal asked English professors Henry Lilly and G. R. Wood to come up with reading lists for contemporary drama and for those of a more historical bent the English Renaissance 1350-1660. Atoms in Action (Harrison). To see the full list, click on the link below.